Hi all! Just a fun and quick ATC swap. 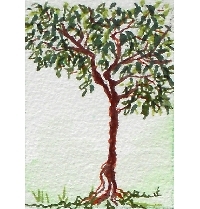 Rules are simple: Create 2 tree themed ATC's, 2.5"x3.5", to send to your partners. The ATC needs to be thoughtfully put together. I am not super snooty when it comes to the design of it, but NO sticker slapping of any kind. Think, "is this something I would like to get." If not, then re-do it. ATC must be backed on layers of heavy card stock or other stiff backing. A clear sleeve is not mandatory. The ATC can be mixed media, pictures, collages, colored from a stamp or digital image or a mix of a few different mediums. No 1's, no matter how old. No recent 3's, within the past month. If you have a three that is more than a month old, please message me about the situation and we can go from there. Can the ATC be watercolour painting without additional embellishments? Would this be 1 card for each partner, or 2 cards for each partner?